"Casa de Paraguas" makes unique parasols from antique textiles and vintage kimonos in a small atelier in Itami city, Hyogo prefecture, Japan. 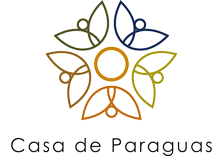 "Casa de Paraguas" means "House of Umbrellas" in Spanish (casa＝"house", paraguas＝"umbrella"). At the same time the pronunciation for "casa" is the same as "kasa" which means umbrella in Japanese. I named my brand like this so one can image umbrella and the warmth of home at the same time. After graduating from university, I experienced several jobs until I became pregnant and turned a stay home mom. At the same time, I started making things using the sewing machine. I enjoyed recycling thing in my house and customizing it to suit my taste, or make things to give to my friends as gifts. One day, my umbrella broke. The bone was broken and I could not use it as an umbrella anymore, but since it was my favorite, I could not just throw it away. Trying to reuse it again somehow, I worked on my sewing machine and made a basket cover for my bicycle. 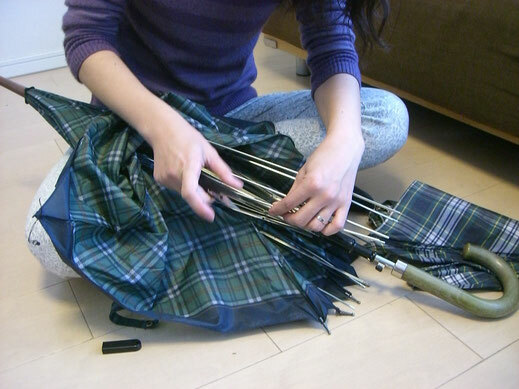 That was the start of my umbrella upcycling. There are so many umbrellas that are abandoned in the world. I wanted to give another chance to those umbrellas. The basket cover was really useful so I wanted to show it to others. And if I were to introduce it to my friends and families, I wanted it to be super cute and original. That is how I started my original brand "Casa de Paraguas". episode 2 Too much in love with umbrellas !? 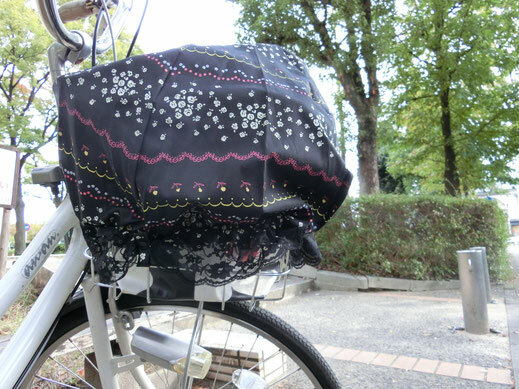 So I started out making bicycle basket covers out of fabrics recycled from umbrellas. Soon my repertoire grew to a wide variety of items. Around this time, I was so into umbrellas that just looking at a nice umbrella made me very excited. I was extremely devoted to umbrellas that soon I started taking interest in the structure of the umbrella itself. And finally in 2014, that love moved me to a point where I myself started making umbrellas and parasols. I started out without any knowledge or experience, but as I kept making parasols my own way, people started asking me to make one for them. 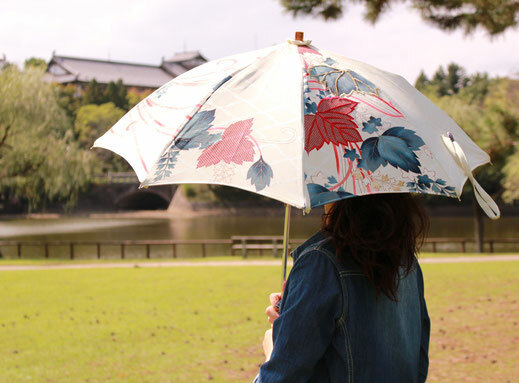 Currently, I create original parasols by upcycling antique kimonos, while I make parasols to order. Now I do not do umbrella upcycle due to my capacities, but it is my unchanging wish to "give another life and keep on using the beloved things" by upcycling. When I first started making higasa parasols, most orders came from my friends with high fashion sense that wanted original parasol made from textiles that suit their tastes. But soon, my works spread through word of mouth and began receiving orders from people I haven't even met that read my blog and web site asking to make parasols from their loved ones'keepsake kimono. My unique works are often introduced in TV and newspapers. Many people have kimonos handed down from their mothers and grandmothers. They are most of the time kept in the bureau for a long time without wearing. Even if you wanted to wear them, the size may not fit. Stains appear over time. Selling them will end up next to nothing. How sad and upsetting! The former possessors' feelings are lost in vain. Isn’t there a way to pass down the owners' feelings and keep on using the kimonos? Like this, people seem to find out about me, and order the parasols for themselves, or for families and friends to share the keepsakes. Currently, parasols are used only by women in Japan and some parts of Asia. Parasols not only protect you from the ultraviolet light and the heat of the sun, but the parasol itself has a beauty and grace of its own. However, parasols aren't valued much in the western countries nowadays. I want to change that situation! I don't want to keep the culture of higasa only in Japan. And also, I want to propose kimono to the world as a chic essence to add to their fashion, not just an old and outdated thing. Combining these two might become a mission only Casa de Paraguas can challenge. I want to make higasa by upcycling kimonos. I want to give life back to the old but beautiful antique kimonos. I want to keep on working on it. And I want the world to know about it. This is the goal as the representative of Casa de Paraguas, and I am to commit to it for the rest of my life. I also have another great goal. That is, to create fabric goods not limited to parasols combining kimonos and used denims and to sell them worldwide. I will design the goods myself, and the sewing will be done as a "community business" where neighborhood seniors with high handmade skills will work together as a team. Life-long experiences and relationship with these people are priceless. I would like to nurture good relationship with those who sympathize with my policies and are willing to work in team with me. 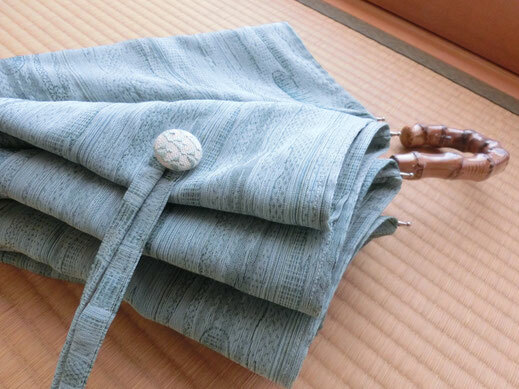 Beautiful pieces of silk, too small to make a kimono, but still very attractive. I wanted to make use of such fabric to the very end. That brought me to my other favorite material, used denim. Combining my two favorite things. Japonesque with a sharp edge. Grunge fashion. Combination of Japan and the west. Mixture of old and new. Upcycling. Collection of my favorite things. That is my brand, Casa de Paraguas. To keep on creating something everyone can be happy about. That is the idea of "Sanpo-yoshi (三方よし, all three sides benefited)" à la Casa de Paraguas. Even if the shape is changed, I want to keep on using the refined goods made through Japanese tradition. I want to propose "upcycling" to the world. This is the form of my new project towards the future. Giving shape to memories with the magical touch of "Upcycling"
Casa de Paraguas will continue serving you with handworks done with care, one by one, with all my heart. I am a "CASA Remake Artist" and I guess I am the only one in the whole world with this title. "CASA" means "house" in Spanish and also the same sound "kasa" means "umbrella" in Japanese. My activities are based on these two "CASAs." I had a strong love for making things ever since I was a child. However, my life went through all twist and turns. I have tried many things and failed in many things. But all those experiences have become a part of me, and none of them were in vain. I work as "CASA Remake Artist." My concept is to make my customers happy by upcycling their favorite fabric items such as kimonos and dresses into something he/ she can use with a renewed love. I work on creative upcycling arts as my lifework. My dream is to let my artistry take shape in my favorite place, Paris. I want to see my works in a chic shop on the streets of Paris. And moreover, I want to have my own exhibition in Paris as an artist representing Japan who creates unique upcycling works combing the east and the west. My straightforwardness keeps me from telling even the smallest lies, and I sometimes may sound harsh or too serious. I am not a good speaker, so I have times that I feel bewildered by myself for not being able to communicate what I really want to say. But, recently I have learnt to think that as my uniqueness. Basically, I am just an ordinary housewife that is fond of cute, lovely, heartwarming things and things that have a good background story. I am as curious as a cat. I am interested in people with multiple talents with an interesting history and artisans, old and young alike. I really love people and I have so many idols that I admire. I like to keep my pace and is true to my likes and dislikes. Still, I wish from the bottom of my heart to become a mature person through interaction with people and to make everybody that I come across happy. My motto is "The Only One than Number One"
Copyright © Casa de Paraguas All Rights Reserved.